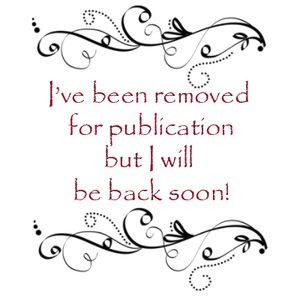 Anyone who knows me will know that I am not really into all the machines and gadgets getting released onto the scrapbooking market - it just seems too like everyone is trying to sell us something new every week. But, then along came the Cuttlebug. I tried and I tried to resist, but it was fruitless. This machine is very reasonably priced, and it does so much. It embosses, it cuts (including metal, chipboard, vinyl, felt and on and on and on .....) and it takes most of the other machine dies as well. I tried in with my Quickutz dies and it cuts through them like butter, 12 letters at a time! Jodie at Scraptacular was one of the first shops in Australia to stock them, and I picked mine up last Friday. 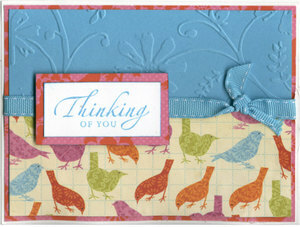 I had a play over the weekend and among other things made these cards using the new Scenic route and Basic Grey papers. The embossing is such a breeze and the images are so crisp. I love it. 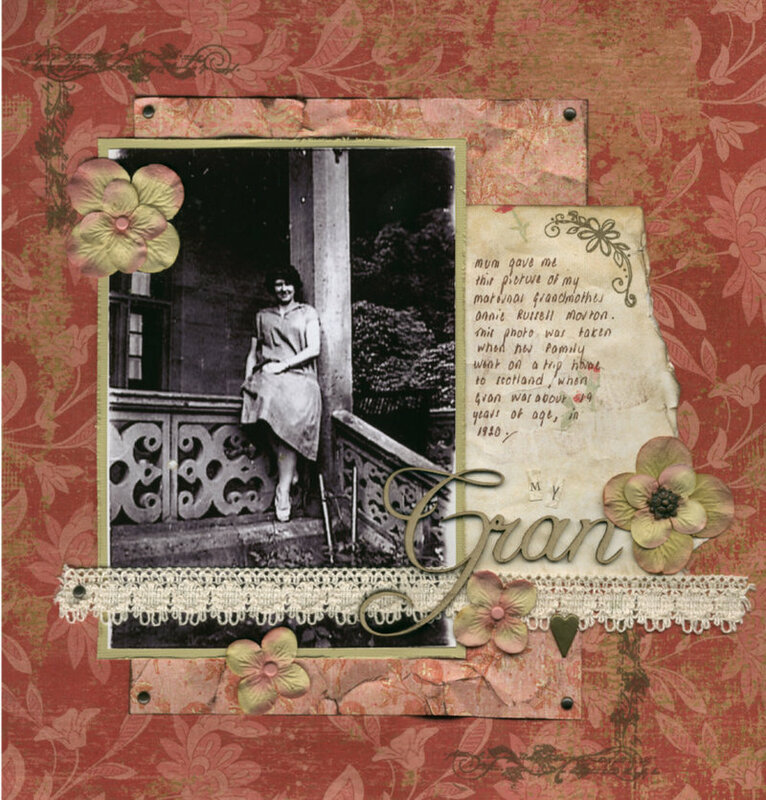 I also did a layout using the gorgeous Stella Ruby BG papers, but that will have to wait until Thursday to post as it's for my March She competition layout at Scraptacular, so no peeking until March 1st! Don't forget you still have a few days to get your layout in for this month and be in the running for a $20 voucher - nice discount on the Cuttlebug maybe? Have you seen the latest FK? Robyn (staff) and Brooke (DT) are on the design team, and Kimmy (DT) has a great layout of the most scrumptious looking food in it. Such great photos. She's quite the little photographer Kimmy. Looks like someone was actually paying attention the photo talk in Tom's class after all! Speaking of DT's - congrats to my lovely friend Wendy who has been selected for the DT at her LSS. Loving your work Wen! 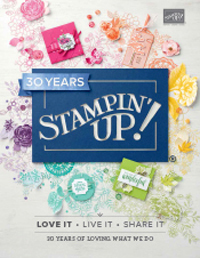 I actually had the pleasure of spending the evening at Wendy's doing a workshop to demonstrate some of the Stampin' Up! goodies. Lovely night with creative friends, and I was very impressed with the table service from Dunk! Thanks guys! Tonight I demonstrated some ways to use colour on layouts using this layout (sorry about the dodgy scan cutting the top off!). This photo was taken when Sam was 5 months by Rachel Leeke. I wanted to incorporate different ways of adding colour to layouts. 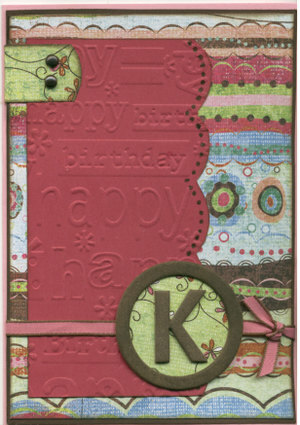 I started by using the Crafters Workshop template from Scraptacular and the Stampin' Up! 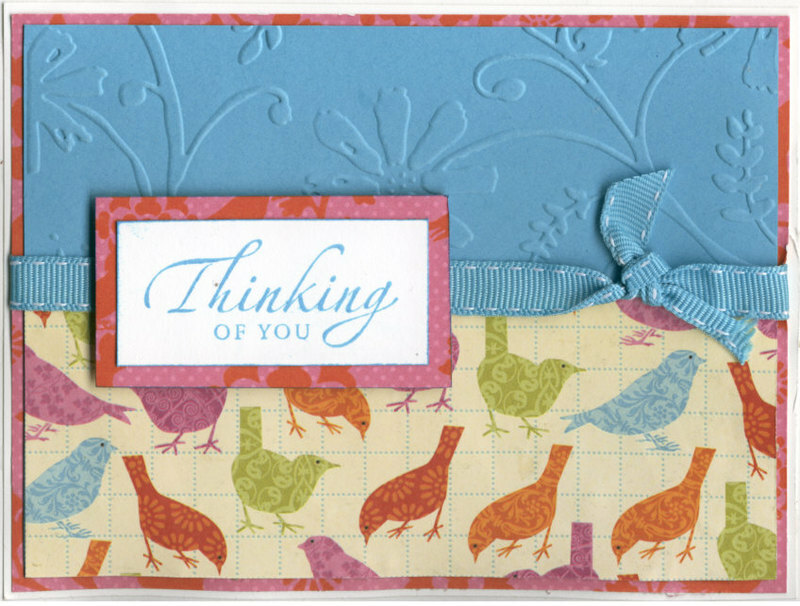 Stampin Write Marker (Always Artichoke) to draw the stems. I then used the two step stamping technique to do the leaves using stamps from the Mixed Bouquet set. The Stamp-a-ma-jig really helped with the placement there! next I used my Delight in Life (free with qualifying orders up to 26th Feb!) 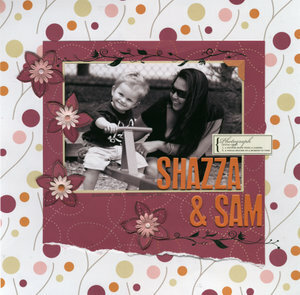 sell-a-bration stamps to do the flowers on a separate piece of cardstock, and watercoloured them using the Stampin' Up! Pastels (Perfect Plum) and blender pens. I then cut them out and added some foam tape for dimension. Then I finished off with the 'Poppin Pastels' technique to add the light pink sections. With this technique you stamp the image in Versamark and then brush the pastels lightly over the top (I used a cotton ball). A few embellies and there you go. I am really getting into this watercolouring and am looking forward to lots more practice and a lesson or two from the masters in my team when we go to Sydney for the convention in May! 'get' what scrapbooking is all about. It comes to them like a revelation and I am so moved by their stories. 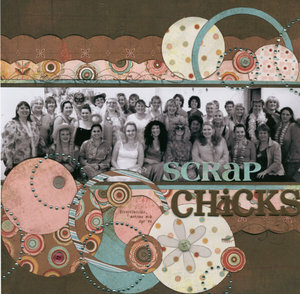 I had an email from a beautiful soul yesterday that I first met several years ago when I started scrapbooking. Her pages and photos are always so beautiful but in the email she passionately wrote to me about how much she was now pouring more of herself into her scrapbooks. That's such music to my ears. That person has a huge heart and it's wonderful her feelings and stories will be preserved in her scrapbooks for her family. This brings me nicely to my version of this months 'She' layout in the monthly challenge I am coordinating at Scraptacular. I am loving doing this and listening and seeing what people are coming up with, and the stories they tell along the way. This months quote is 'She was an artist and her life was her canvas (quote by Kobi Yamada). I chose do document what scrapbooking means to me. I used Paper Loft papers. Not a brand I usually buy, but Jodie had them in and I love the rich colours in them - very me. The letters are Fancy Pants chipboard (from the Biggest Board range) and I have sponged them with ink (using a cotton ball) and then covered them with dimensional magic to give an antique feel. The other big letters are Chip Chatter and the tiny ones are Making Memories. I did the swirls using a crafters workshop template (these are awesome and Jodie has heaps of them in stock - swirls and flowers and journaling shapes etc) and then put dimensional magic on top. The stickers are 7 gypsies, brads are Making Memories and I think that's it :) The actual layout is in the shop so you can get a much better idea from that (and stock up on the new Basic Grey and Scenic Route from CHA '07 while you are there). Don't forget you can win a $20 voucher each month with this comp - more details on the forums at Scraptacular. gone in 14 days. Over the last six weeks I have grown to love these little suckers - my free sell-a-bration stamps. There's only 2 weeks left now until they are gone, gone, gone forever (these are exclusive never to be repeated sets only available during sell-a-bration) and the promotion is over for another year. There's still time to get in quick and put through an order to get one, two, three or all four of the sets! 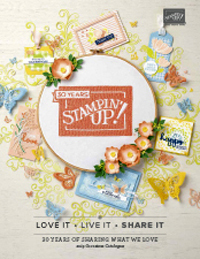 You can read all about the promotion and view the free sets in the online Sell-a-bration brochure. I am happy to take email or phone orders - 03 9735 2946. All orders need to be in by late on the 26th. Six weeks in as a demo and OMG I am so loving it. I have already learnt lots of new things and met so many lovely people in our groups business forum. Here I was thinking I would be struggling to have one workshop a month and I am so much busier. The stuff just sells itself. 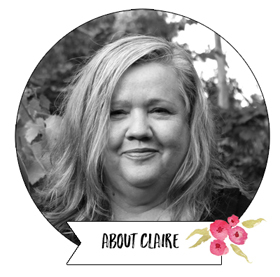 It really is the perfect flexible job for anyone who loves scrapbooking and papercrafts, and sooo much fun. I would love some more local people to play and share samples with, so if you have been thinking about becoming a demo yourself, just email me here cdaly@bigpond.net.au. Now (before Feb 26th) is a great time to join because of the extra free set you get to add to your starter pack (an extra $79.95 for free!). One of the main things I have been learning is more about colour - which colour combinations I like, and how to apply colour to stamped images. 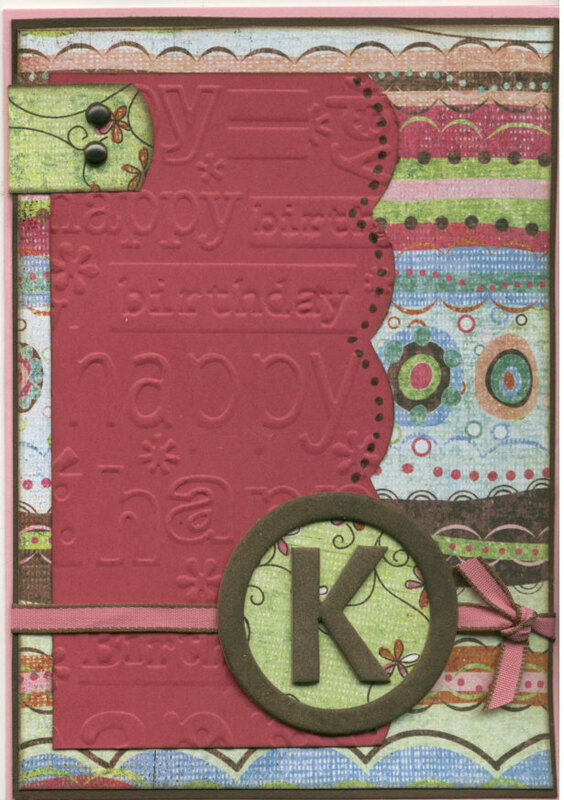 These are two samples I have whipped up tonight using my sell-a-bration sets. 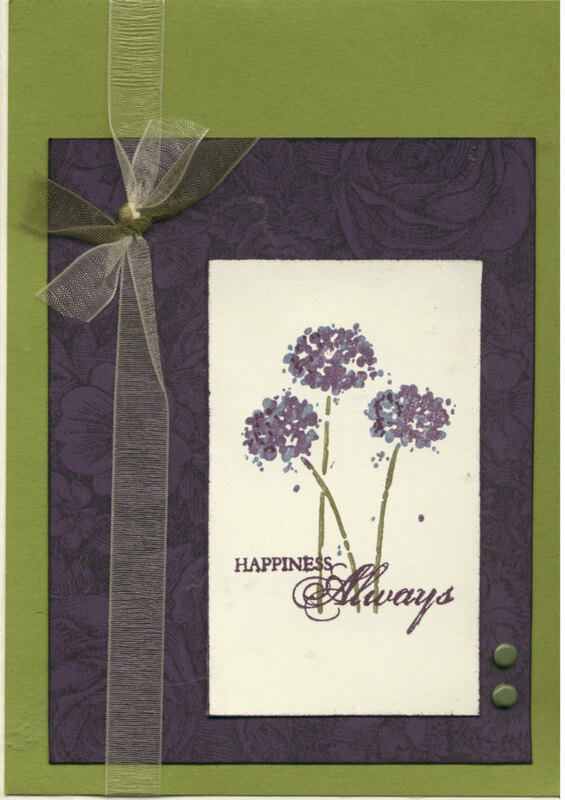 I have used Old Olive, Elegant Eggplant and Very Vanilla cardstock. I have stamped the eggplant cardstock with the floral background stamp using elegant eggplant ink. I then used the Stampin' Write Markers (Rich Regals set - Bordering Blue, Brocade Blue, Elegant Eggplant and Always Artichoke) to colour the stamp (just draw it on and then breathe on it before stamping). Then added the cream and olive organza ribbon and old olive brads to finish it off. In this one I used the Delight In Life stamp set and practised watercolouring the flower. I used the markers again - just scribbled a bit on the plastic top of my plastic stamp box and used the blender pens to draw the colour in. 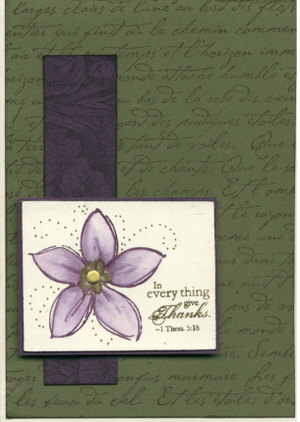 The cardstock colours are Always Artichoke, Elegant Eggplant and Very Vanilla. 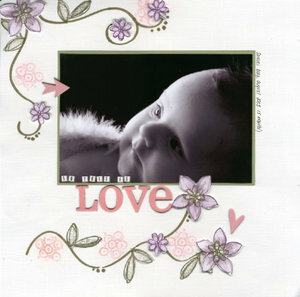 I also used the background stamps again - this time the French Script ones and the Floral again. Last I added a bit of hand doodling with the stamping write markers (Always Artichoke), a brad (so saffron) and some foam tape under the stamped image to add some dimension. That's all for now. 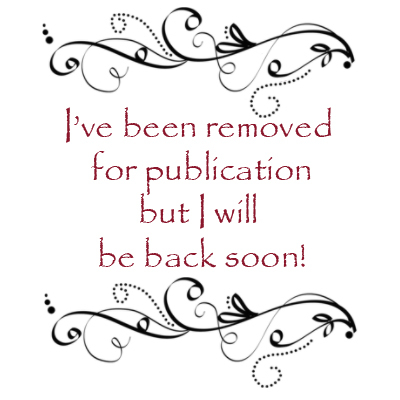 Hope you are all happy and well, and welcome to all the new readers! I hope I can continue to share stuff that inspires you. 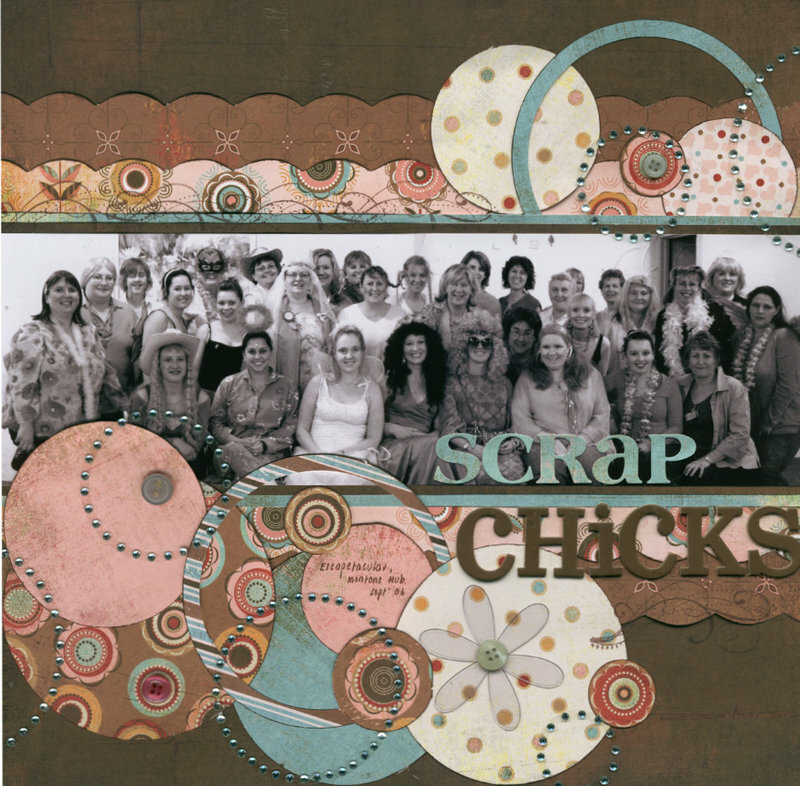 Yesterday I had my monthly weekend scrap at Scraptacular - I go once a month on a weekend day and once a month on a Friday, both for all day and into the night. It's so not about the scrapping. These girls have become such a wonderful part of my life. Sure we scrap, but we solve everyones life problems (and hang a little sh*t on each other) on the way. 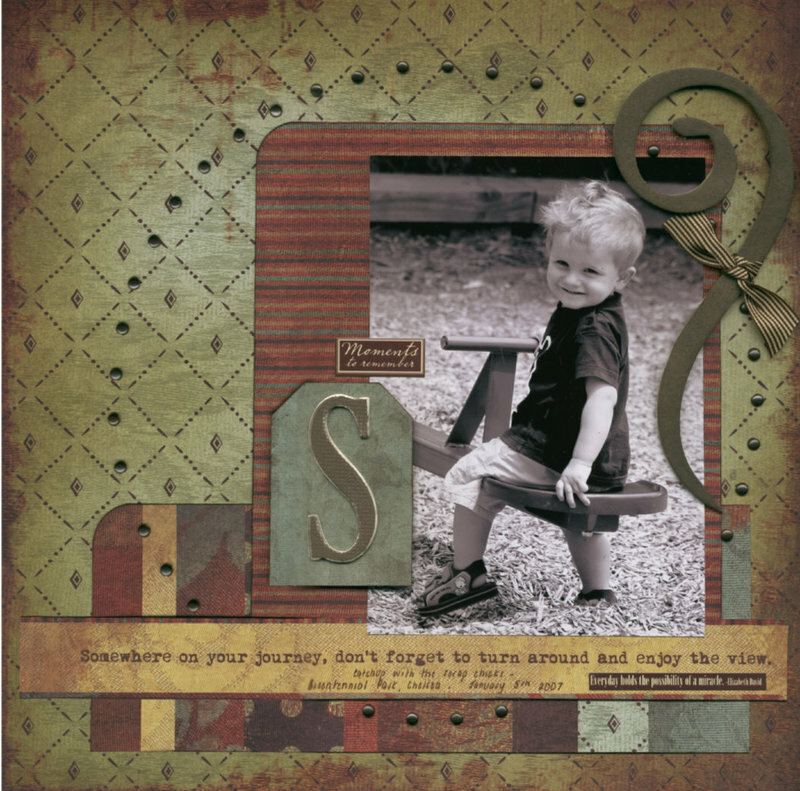 Scrapbooking is so good for the soul. I got 5 layouts completed yesterday as well! I was really organised and had my pages planned out which I think was the key. This one is a a group shop from the weekend away last year. I got lots of requests for this pic yesterday, so if you would like one, email me asap as I will be ordering them this week. These papers are BG Blush, yumm. This one is the delightful Shazza in the park with Samuel in Jan this year. 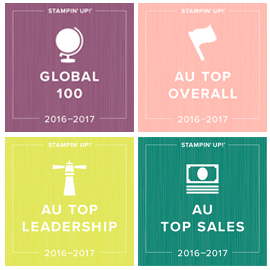 I am loving that Stampin' Up! Delight In Life daisy and find myself using it over and over again to make my own matching flowers. These papers are American Craft. I am loving these at the moment - bright and happy. This picture was taken in December. I have been trying to grow gardenias for years and they always looked spindly and bare and hardly ever flowered. then someone put me onto Harry's Gardenia Fertiliser (I got mine from Acorn nursery in Canterbury Rd Surrey hills)n and OMG the stuff is amazing! I had the most beautiful lush shiny gardenia plants this year and gorgeous blooms. I have started an album about my garden. 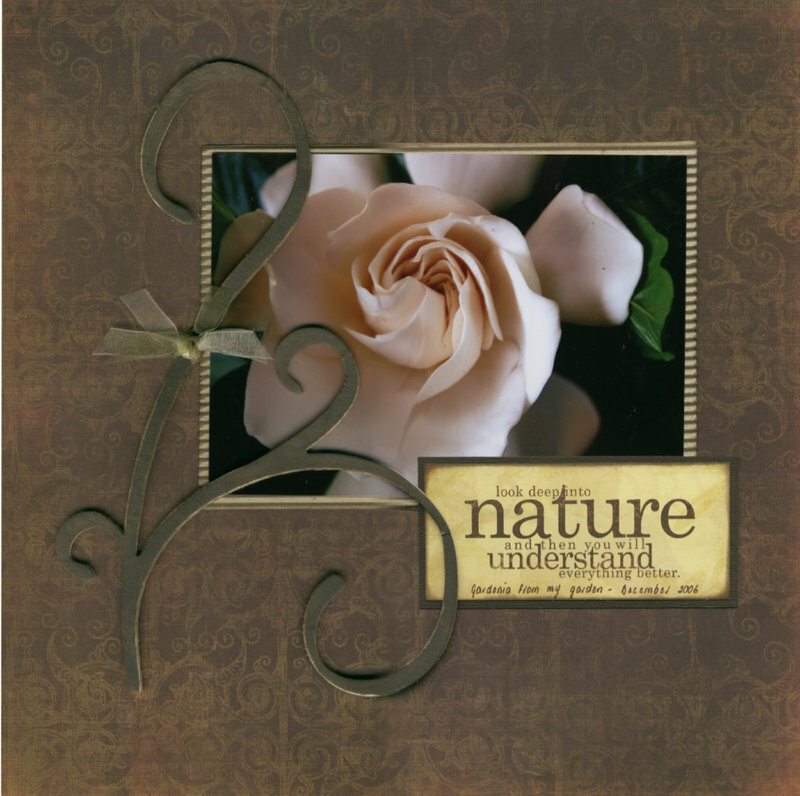 Gardening is my second love to scrapbooking and stamping (not that you would know it at the moment :( ) and I would like to scrap some of the gardens and plants I have treasured. This background paper is My Minds Eye signature suite range, as is the quote. This picture is my Grandmother, aged 19, in Scotland. It was taken in 1920 and Mum gave me a copy. I love it. K and Co Hannah papers here. That's all from me for today. When Sam wakes up we are off to start having a look around at houses to buy - woohoo.